A dog is for life – not just evenings and weekends. Every dog owner needs help at some point with house sitting or walking their dog. It is sensible to accustom every dog to being away from its owner, either being looked after in its own home or elsewhere, as even the most home-loving of owners may suffer an emergency and need their dog to be attended to. Rather than panic and take the first offer in a crisis, it is well to establish trust with a dog walker/sitter in advance as worrying about your dog will only add to the stress of an emergency. The experience and quality of dog walkers and day care services varies enormously. As with most aspects of professional dog care, it is unregulated. Legislation such as The Animal Boarding Establishments Act 1963 may only be enacted in the event of a complaint or not at all. Dog walkers are frequently uninsured or inadequatekly insured. Do not take everything on trust. Research, check and cross check references. Ensure that you have a written agreement. Negotiate and amend it if you think that it is necessary. A good walker will also ask you questions and should have a contract available. Be honest. It is unethical and could land you, the walker and the dog in a lot of trouble if you hide poor behaviour and/or previous problems. Both you and the dog walker could be legally liable in the event of an incident and your dog could be at risk. Your dog does not have to make contact with another person for a complaint to be made and the dog seized. It is sufficient for a person to feel that your dog is not under control and could pose a danger. The police seize dogs first and ask questions later. Those questions may be asked under police caution. Any subsequent actions, including accepting a police caution may be recorded and disclosed to potential employers, voluntary organisations and similar. Even when dogs are released without any further action being taken, they can be distressed and welfare in kennels is not always as good as it should be. Do not expect your dog walker/pet sitter to include other services such as watering plants or undertaking elaborate security rituals such as opening and closing curtains, turning lights and radios on and off etc. Some may agree to do some or all of these things for an additional fee but do not be offended if they refuse. Obtain testimonials and follow them up. Ask if anyone else knows or has used the walker and obtain independent feedback. Provide the walker with a letter of authority to take your dog to the vet in the event of an incident and make sure that you both understand the circumstances under which you expect to be contacted and kept informed. If your dog has a minor scrap that does not result in injury or responds poorly when called, do you want to be informed? Garner feedback from other people who saw the walker out with your dog during the trial period – did they seem confident, did the dog seem content, were there any occassions when they looked out of control, how was your dog’s recall etc etc. This may seem like an enormous amount of effort and, at the end of the day, you will require a mutual trust, but remember, both you and the dog walker could be held legally liable for any complaint or problem (it is not necessary for your dog to have caused actual harm) and you will be handing over the security of your home and belongings. If you will be at work all day, it is not acceptable to leave your dog with “doggy day care” day in and day out, throw a bit of food down in the evenings and expect your dog to curl up on the sofa as you collapse in front of the television after a hard day at work. It is not acceptable to expect an unfit dog to go for a massive hike when the weather is fine at the weekend or spend half a day under a cafe table or spend most of its time being dragged round shops. Alas, this is the reality for many urban dogs whose owners no doubt think that they are having a great time “socialising” with their fellows during the day and “joiining in” with chores and human socialising at weekends. Even owners who do not work or who work from home can end up actually paying very little attention to their dog as they are busy at a computer or with offspring. Maybe they go for a walk in the middle of the day, but how much of that is spent interacting with the dog and how much on a mobile telephone or minding children? There are also holidays or business trips to consider. Many owners will take their dog with them and the advent of the Pet Passport scheme has led to many dogs being taken abroad. However, again, there are times when it is not possible to travel with a dog and a pet sitter or kennels need to be considered. It caused a storm of protest on the forum and one or two people offered to house sit. No one received a reply so the fate of the dogs did not become known. Abuses happen. 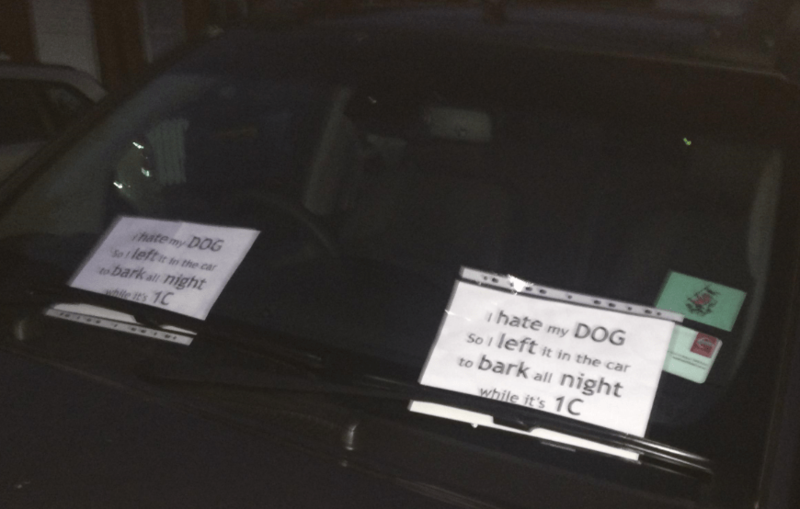 A dog walker near me “kennels” dogs overnight in a car, no water, no ventilation and not always in the same road as her house. Lack of action from the dog warden prompted one local resident to add the sign that you see in the image to the left. No doubt the owners were oblivious. There is a National Association of Pet Sitters that offers some regulation of its members and advice to owners. Even dog walkers who go to the expense of training may not be experienced with a variety of breeds, ages and temperaments and of course, anyone can set up a training course and charge for it, good or bad. There are several agencies who will offer dog walkers who are apparently “vetted”. Here is an example from just one site of the requirements for its dog walkers “Love and passion for animals, strong sense of responsibility while looking after pets, applicants must be over 16 and resident in the UK”. Nothing about actual skills or knowledge. Presumably, the freelancers would be covered by the agency’s insurance, but not necessarily. There is a web sites that pairs up dog owners with people who would like a dog but cannot have one. The dog is then “borrowed” when the owner is unavailable. Just because dogs are chattels in the eyes of the law does not mean that they should be passed around like living toys. Use these sorts of services and you may well be saying goodbye to your dog and hello to a lot of legal trouble and heartache. There are also web sites advising how to make “easy money” by dog walking. Is it really “easy” to have the responsibility of looking after someone else’s dog, deal with a large variety of temperaments and breeds, untrained dogs that pull, have no manners and no recall? Consider whether you want your dog to be bundled up in a van and driven around while lots of other dogs are picked up, subjected to the noise of a van full of excited dogs and then allowed to run amok in an ever-changing “pack”. What may seem like “fun” to a lot of dog walkers and owners is in reality very stressful for most dogs and certainly does not help with training. Many local authorities are rightly restricting the number of dogs that can be walked at any one time. My local authority limits it to 4 – that’s a cardinal compass point each for them to head to at speed as soon as they are let off the lead! Of course dog walkers also meet other dog wakers resulting in large numbers of dogs racing round off lead which can and does cause problems. Such restrictions may also mean that unscrupulous walkers will curtail walks in order to earn the same amount of money. Think before you get a dog. Think when you have a dog. Don’t let your dog suffer because you do not do your homework.